Hop onto the Way Back Machine with me, folks, and let’s take a little spin. Allow me to remind you how this backyard shed supreme looked 18 months ago when we moved into this house. In a word, dreary. Our contractor was Step 1 of the transformation and came in to help keep the shed upright. While he was in there reinforcing the structure, he added a window and shrunk down the door a bit. Which is where you lovely readers hopped on board back in Week 1. As you recall, the shed walls got paint, the ceiling got pendant lights, the windows got flower boxes, the floor got painted, and then I took that thing by the reins. 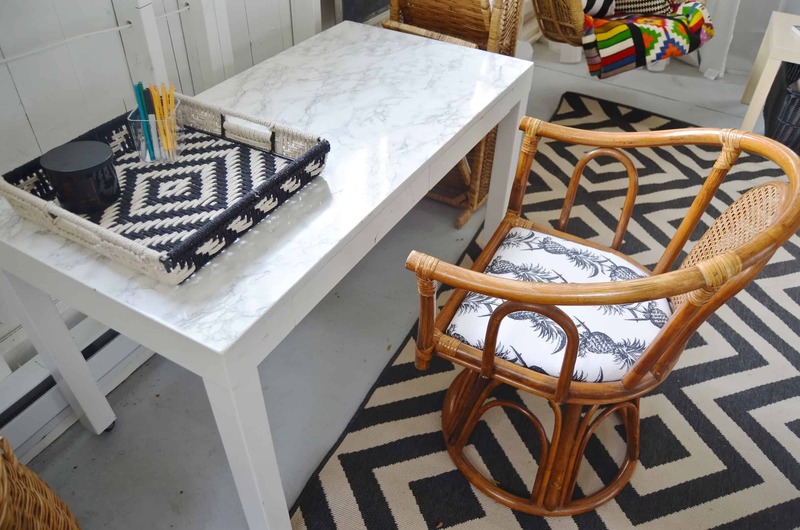 I considered calling this post, Operation Hoard but that didn’t get me enough SEO… I was able to furnish and design this space by using all of those wonderful treasures that have been taking up room in the basement or garage or the attic for the last few years. My husband is a patient man. The back of the shed isn’t water tight so I wanted to make sure to elevate things off the floor. Shelves hold spray paint and cleaning supplies as well as all those little things I can’t pass by at the flea market or thrift store. When things like this are hidden away, they don’t get used so I’m thrilled to have a spot where I can display and easily access them all for photography, etc. Along the right wall of the shed is my work bench. I have paint supplies and larger hardware items in tupperware underneath the bench, but smaller items like screws and nails and nuts and bolts are in containers along the back of the workbench. The green rolling tool chest was my Christmas present last year and it is the JAM. It fits everything and the drawers open like a breeze. Far acry from the piles of boxes I’ve been rifling through since we moved! Both my miter saw and my table saw are portable so typically I just bring them right outside, but I also have a shop vac tucked away and will happily cut wood, etc. inside the shed if need be. Guys, this space is a work horse! The front half of the shed is the prom queen though. 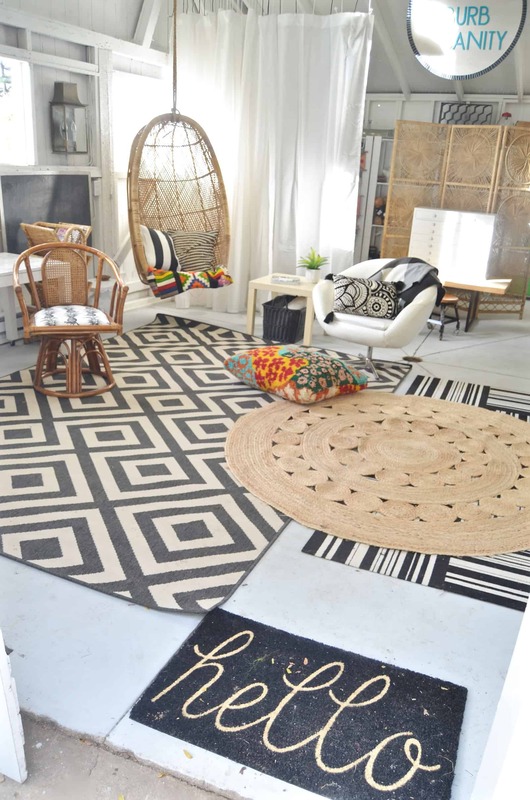 An outdoor carpet gives the whole space a graphic ‘how-do-you-do’ and sets the tone for lots of the other accessories and decor. 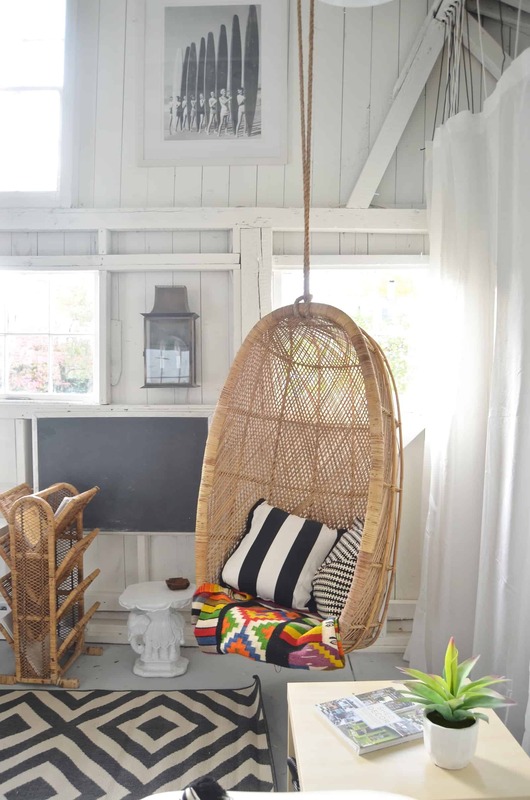 A seating area is flanked by a hanging rattan chair and a salvaged white ‘leather’ chair. I put Eleanor’s old desk onto casters and covered the top with marble contact paper to clean up all the marker scribbles. Hopefully I can slide this around as needed for photography and crafting. 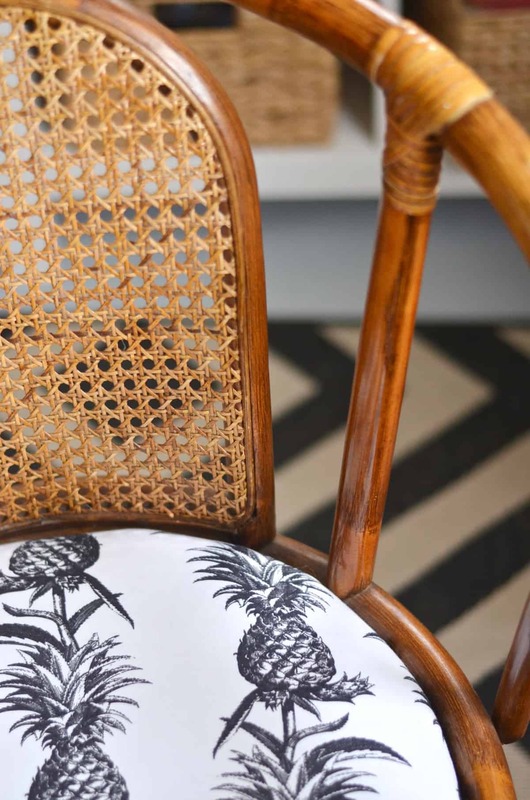 A flea market swivel chair has an updated look thanks to an $8 piece of flea market fabric. When I’m entertaining Martha Stewart and Emily Henderson, I figured this could be a great extra seat, swiveling to be both a desk chair and part of the larger seating arrangement. 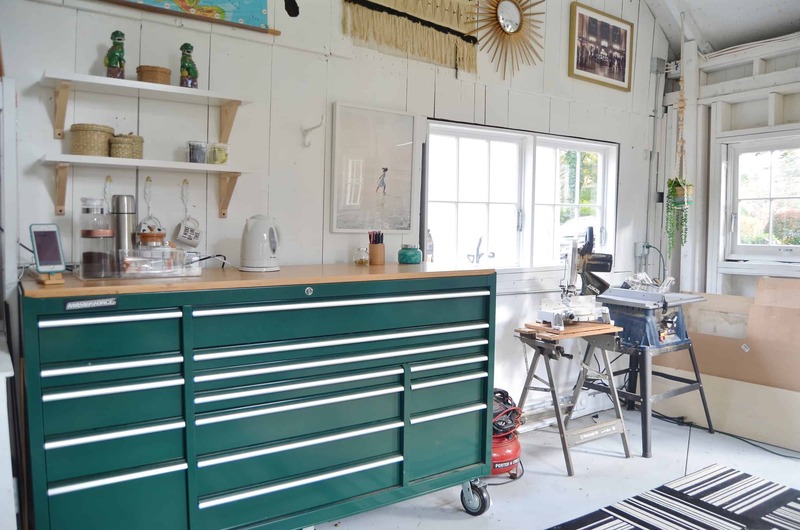 Barn lights sent over from Home Depot illuminate the space and match the rolling tool cart. Did you catch the floor pillow? 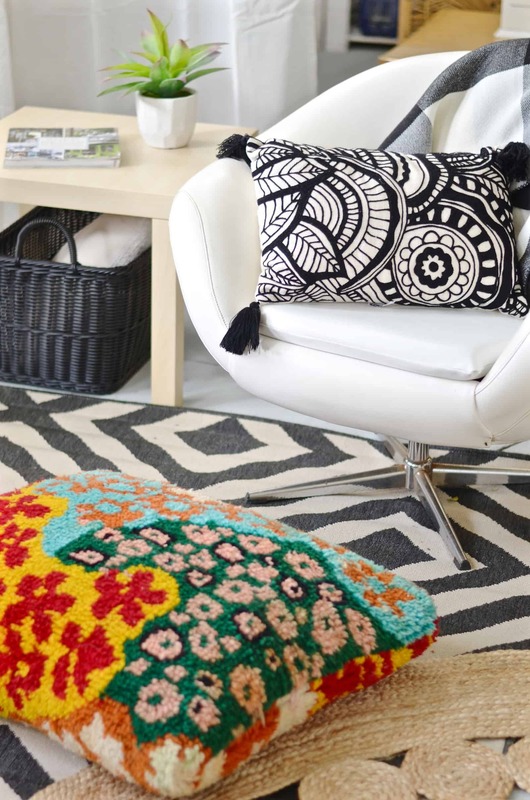 That is a shag rug I dug out of a vendor’s area and sewed to make that cushion. Stuffed with Ikea throw pillow inserts, it’s great for lounging or for resting tired feet. I went into detail about how I planned out the artwork last week, but you’re now getting a glimpse of the whole space. 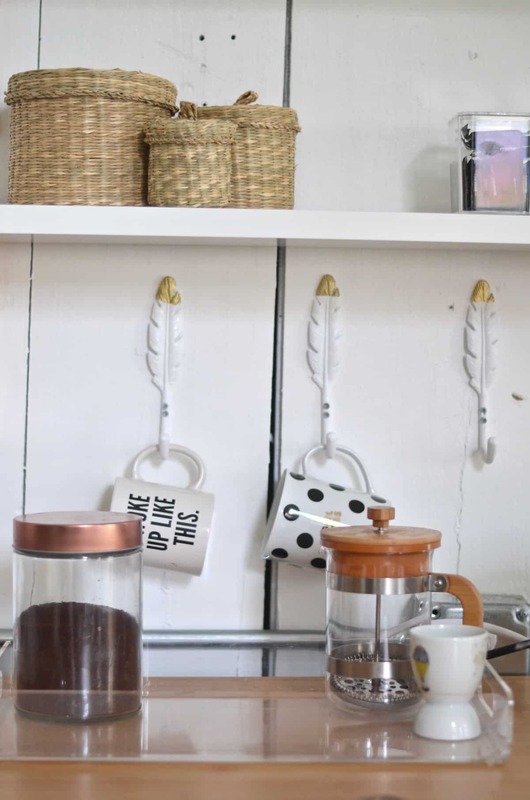 I love my Minted photograph hanging above the tool chest right next to my coffee station. One detail I was hoping to incorporate into the shed was a backdrop I could use for video work. This Ikea curtain system works PERFECTLY. (Tutorial coming later.) I can pull the curtains when I need to block of the clutter in the background. 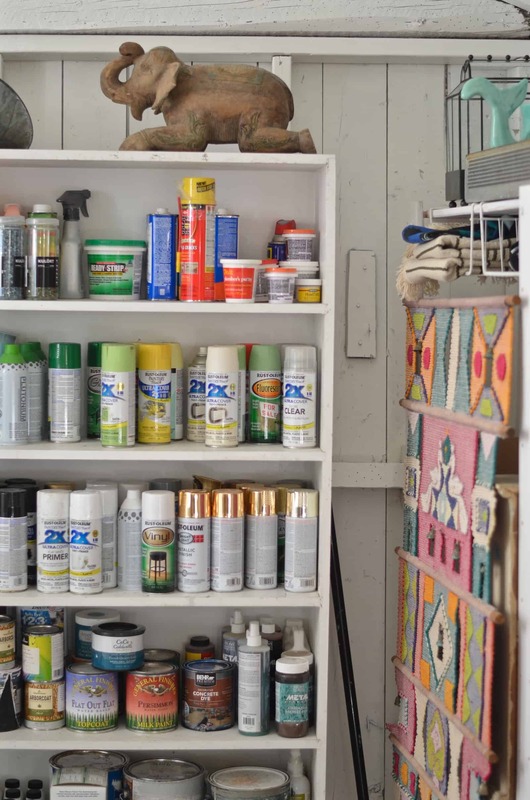 Something this shed has made me very aware of… is that decorating is a personal thing. We decorate a space that WE love. A space for US. Do we want a space to be magazine worthy? Sure! But more important than that is a space that makes us smile when we walk in. A space that motivates us. A space that informs our creativity. This is why we decorate. Is this space pristine and symmetric and ‘zhooshed’? Nope. It’s quirky. The shelves aren’t styled but rather are arranged so as to fit as many things as possible. 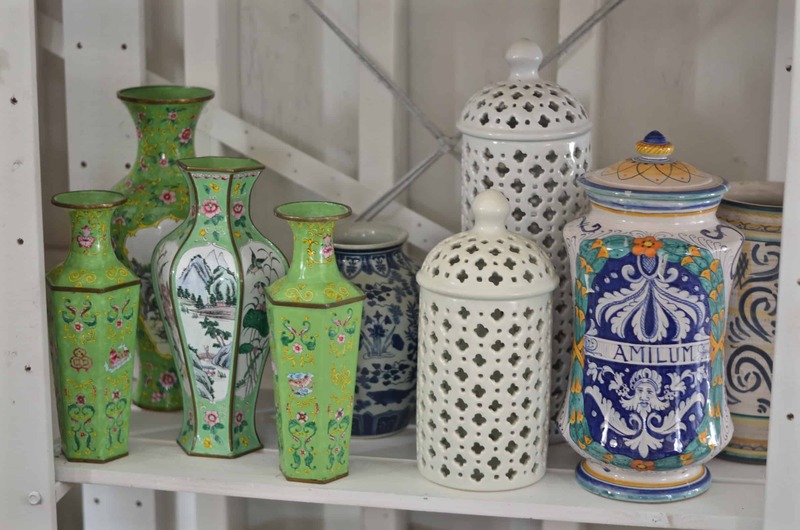 Most items are thrifted or pulled from a flea market field. There aren’t many right angles to be found and everything’s the tiniest bit crooked. I suspect I’ll be in the company of mice and the occasional squirrel, but this is MY space. Filled with things that I have collected and found and treasured. 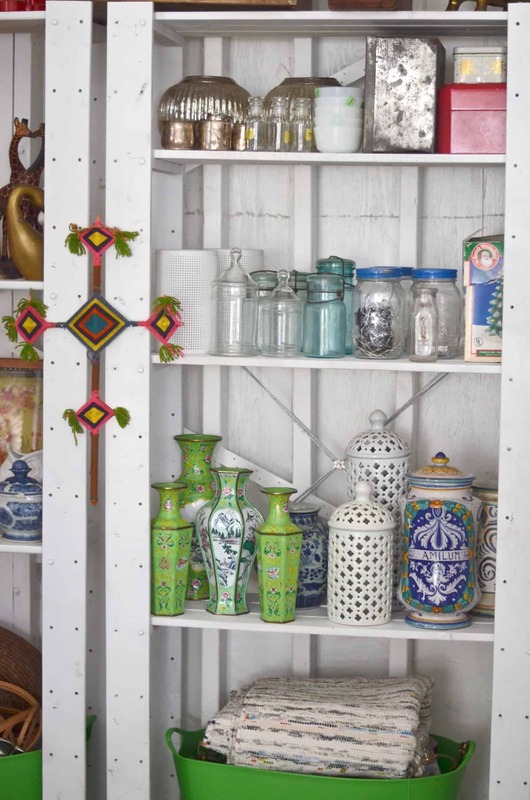 Whether the antique flea market sconce, foo dogs on the shelves, the painted filed cabinets, or the re-imagined smiling Buddha… there’s a lot of happiness in this shed! I can’t thank you all enough for cheering me on throughout these past six weeks. Normally a project around here is a solo act, but this shed has had lots of encouragement and good company. And as usual… head over to Calling it Home to see the link up for the everyone else’s One Room Challenge REVEALS! Also… below are any sources I could find for you. 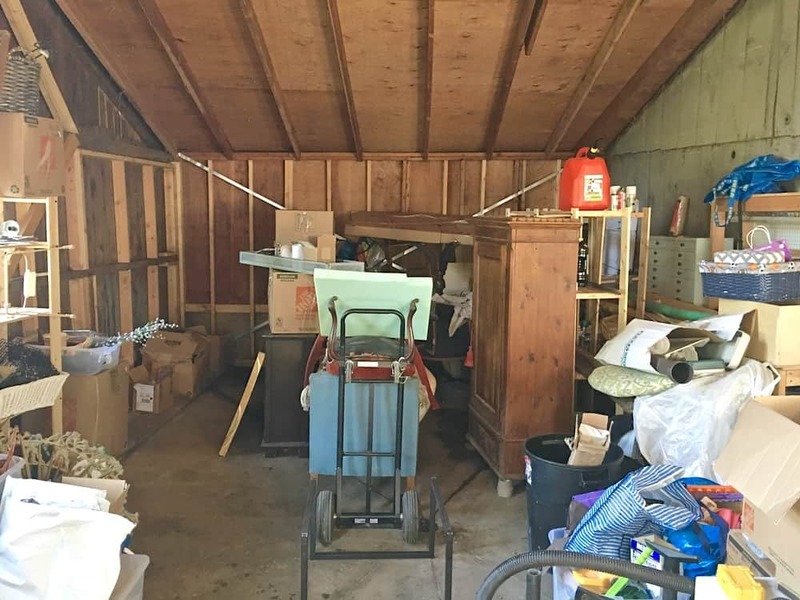 SO many things in this shed are thrifted or unique, but… I scoured the web and definitely found some items that are almost identical! Ikea LACK side table. 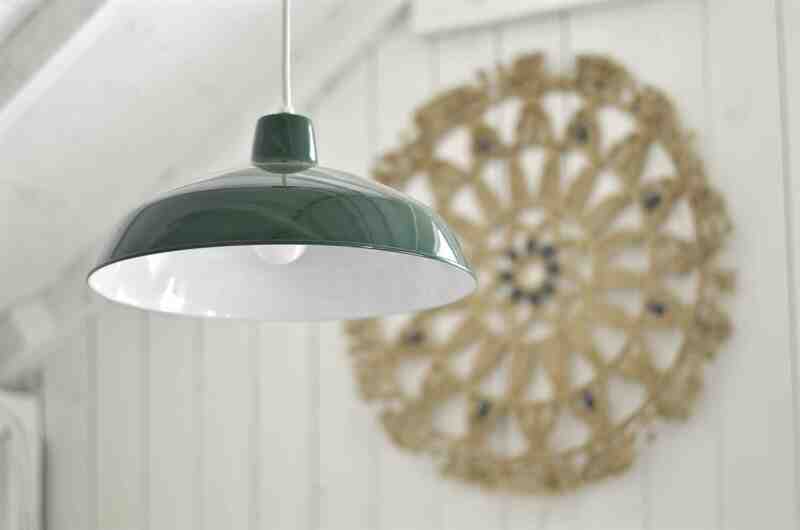 MUCH cheaper AT Ikea, but this is a link so you know product details. Storage Shelves. Again… probably cheaper at the store, but wanted you to see which ones I used. Is it too late for a couple last Before/ After pics? Nah… I didn’t think so! It looks amazing! You did such a great job. I want to come hang out in the shed and have a DIY day! Thanks… the power of paint alive and well! THANKS! Pouring a glass of wine and ready to start ogling the others! 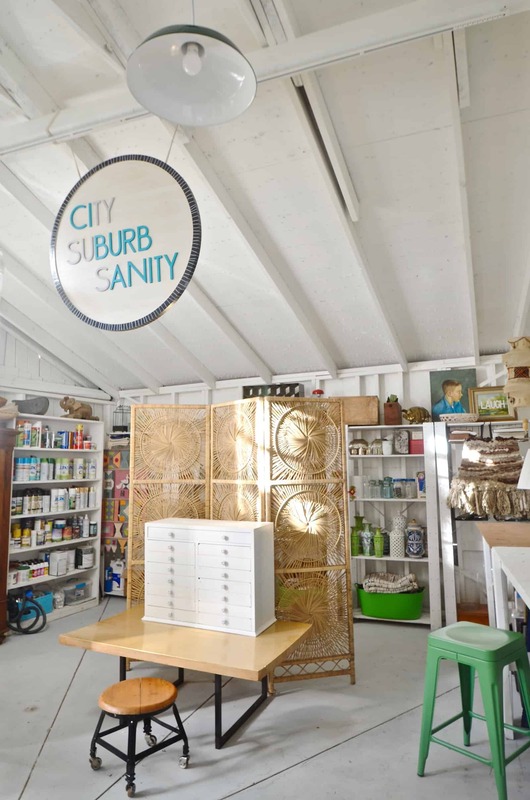 Charlotte, the shed makeover is FANTASTIC. I’d pretty much KILL for a space like this to write in; for now, it’s my living room; but commuting to a shed in my yard with that kind of space and light and room for quirky things I love will remain my DREAM. ENJOY IT so much!! 🙂 I really love it. Was telling a friend it’s not a pristine space or anything, but it makes me super happy to have all my weird quirky things under one crooked roof! Ahhhhh!!! It’s awesome Charlotte!!! So many great chairs, is my first thought. And the rolling tool storage is AWESOME. It looks so bright and happy and cheerful in there now. It’s fantastic. Isn’t that storage AWESOME! I wasn’t so sure about it when Mark wheeled it in, but it is the BEES KNEES!!! This is truly amazing Charlotte!!!! That was alot of work, but so worth it. I also love how I can “shop” your post. Holy smokes, I’m completely in awe! I LOVE this magical and creative space, a wonderful place to make huge fun messes without the worry of house stuff, every creatives dream a “sandbox” to play in, excellent job a great big congratulations to you! Yes! To be able to start something and just LEAVE it will be a real luxury! Thanks, Laurie!! Spectacular! That will be a great creative space…can I get an invite when Martha and Emily come to hang out ( two of my favorites) ? I love love love it. 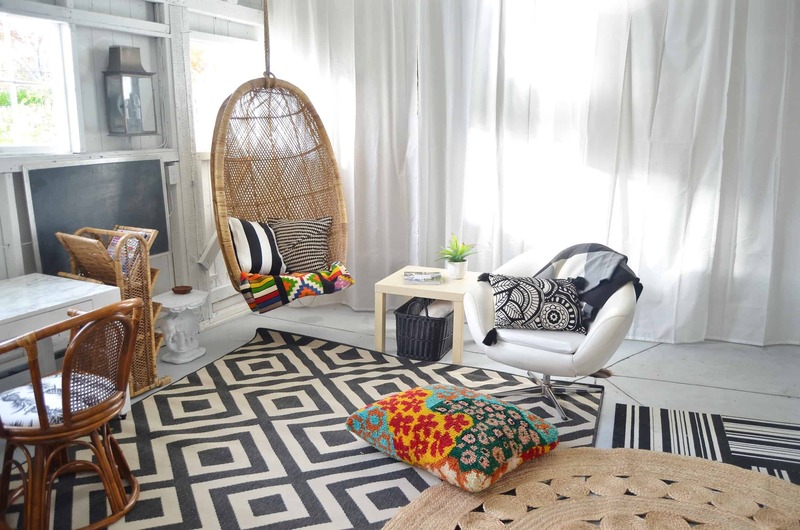 What a bright, beautiful and creative space. THanks, Julia! It’s a fun little reprieve for me!! charlotte, i am absolutely in love with this space!!!! 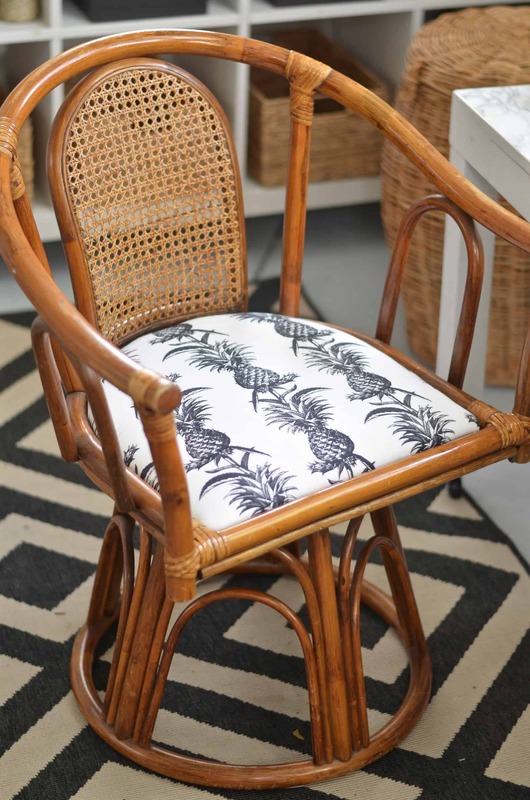 every detail is just perfect- love the swivel chair and that flea market fabric! i want to come hang out!!! Isn’t that fun?! How could I pass that up, right?! Thanks!! Wow! 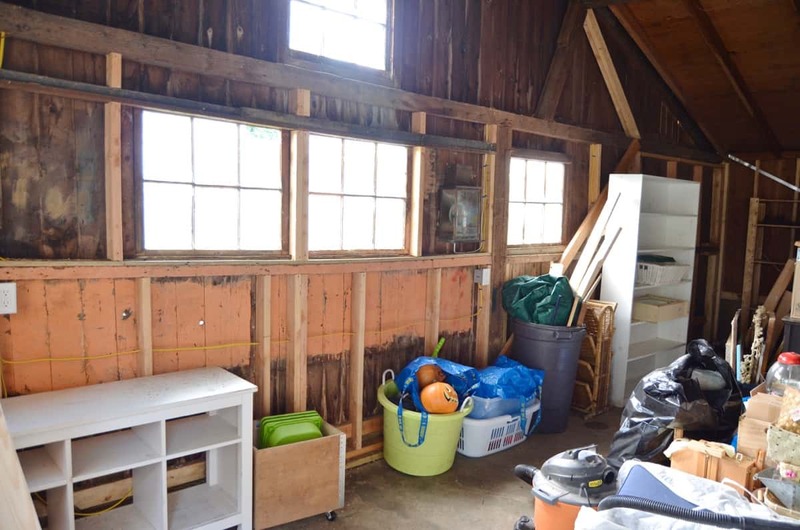 You transformed this shed into an organized, bright & beautiful multi-purpose space! Fantastic job! Thank you! I’m so pleased to have this newfound workspace!! Spectacular! I would die to have a stylish working space like this where everything is organized to perfection! You did a fantastic job! Congrats! You’re too kind! THanks so much!!! OMG!! This just might be the coolest space I’ve ever seen. What a dream to have something like that to work and create in! It’s the bomb!!! 🙂 THANKS! You are way too kind! I never know how my quirky vision will translate to anyone else! Are you kidding me with this? It’s awesome! I’m dying of jealousy over here. 🙂 Thanks, friend! I’m pretty stoked, myself! I can’t even begin to tell you how much I love your shed! 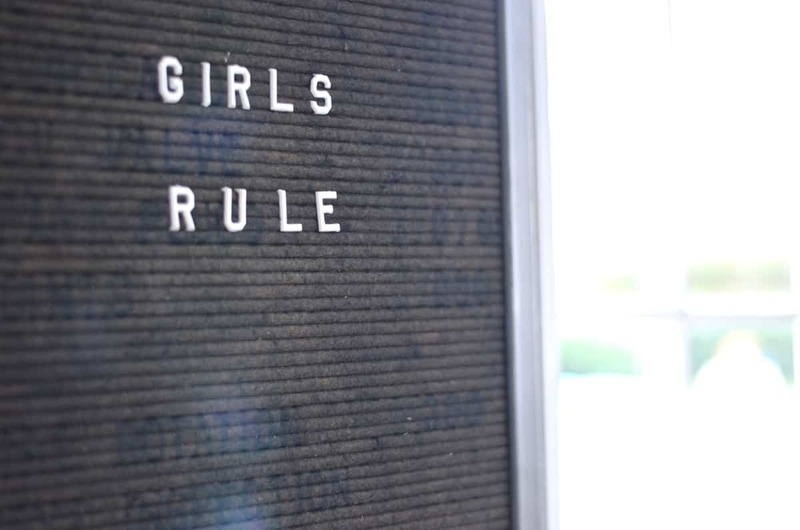 And, your husband…that sign is one of the most thoughtful presents ever! So sweet! Congrats on an amazing makeover! Thanks, Robin! I don’t know where he found the sign maker, but isn’t it great! It’s been sitting in our basement… I was so happy to finally hang it!!! That white has done wonders to this shed. It looks so much larger!!!! I was shocked to see all the little stations. 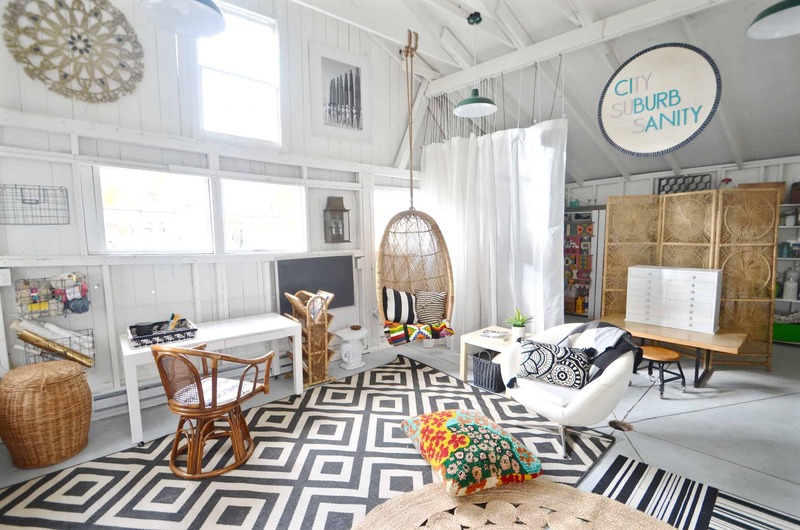 This is my favorite garage/shed makeovers!!!! I love how you are able to use used/thrifted items to decorate your space and still make it look cool and functional. ?? Right?! The white was transformative! I could have painted it white and published my reveal with just that!! 🙂 Thanks, friend!! Yes! 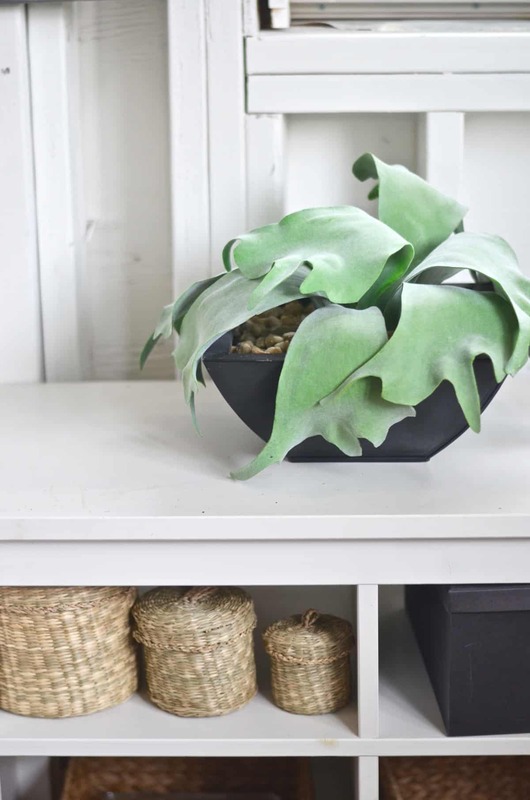 One room I’ve been waiting for the final reveal and what a stunner it is! 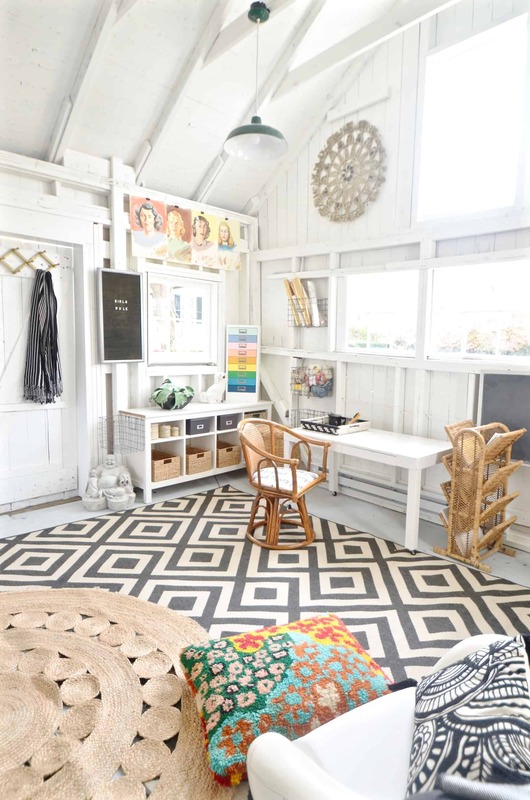 The She Shed of my dreams! Congrats on a stellar job with equally as gorgeous results! Love it all! This came out so awesome Charlotte!! 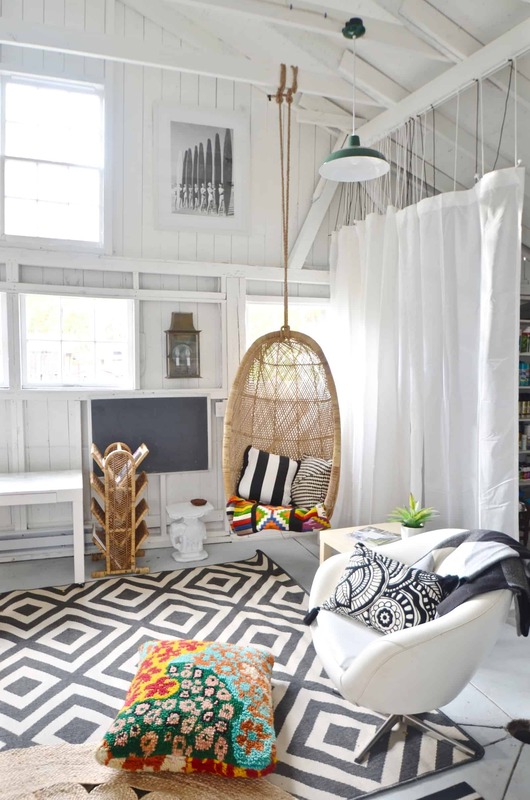 It looks like a fantastic work space, and just a fun spot to hang out! Charlotte, what a great space! Oh my gosh, I’d never come out of there if it were mine. I just know there’s going to be a whole lot awesome being made in there. Nicely done! Charlotte!! Your vision for this blows my mind. It turned out incredible!! This is absolutely amazing, my friend! I am so wildly impressed with the whole transformation and the final result! INCREDIBLE!!! This shed has your name all over it Charlotte. It is so much fun and so full of life. Your personal style is all over it! I love all that color against the white. You did a fantastic job in completing all of this is such a short span of time. Thanks, Mary! Once the paint was on the walls, the rest was the fun part! So thankful for painters on this project! Charlotte!! Wow!! This is unbelievably awesome. I totally need this in my life! I’m showing this to my husband:) I’m sure he will be thrilled – he is very familiar with operation hoarder! HAHA! It’s a gift that this shed as definitely enabled! 🙂 Thanks! I literally gasped out loud as I scrolled down the screen from before to after. WOW!!! 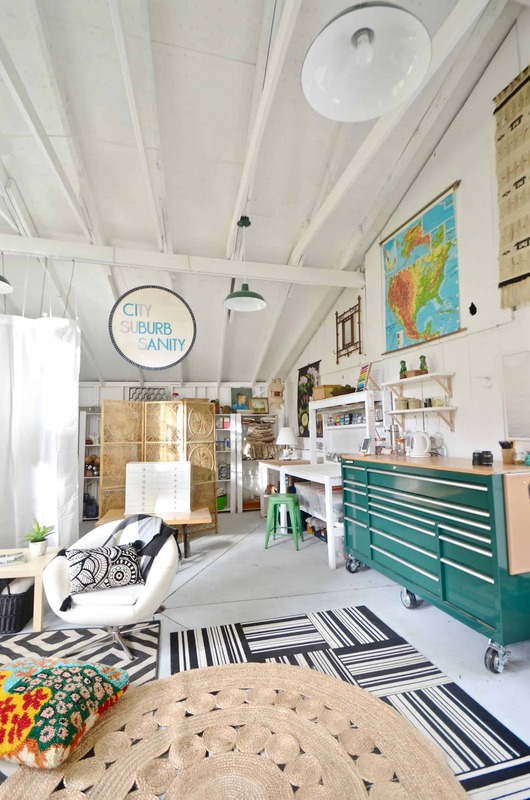 Such an awesome space with so many fun and interesting details to look at! That green work bench is my fav!!! So well done! Enjoy your new workspace! Your shed is wonderful, Charlotte. It looks exactly you – so much fun and a little quirky. I love it! Omg! Your shed is amazing! It has such personality! Wow, words cannot describe how much I love this space!!! HAHA. You can order one!!! Thanks!! Thanks, Jo!! You’re invited any time! It doesn’t have real heat and the dog barks 40% of the day, so come prepared! 🙂 Ha! What I wouldn’t give for a space like this!!!! Maybe one day! Yes! They come prefab and I LOVE the idea of taking the preorder ones and just PIMPING them out!!! Let’s get a lunch date set up. Terrain? How does your schedule look the week after Thanksgiving? SAY WHAT!!?? Charlotte, I love it. I love that it’s soooo you. It’s bright, colorful, fun and vibrant. Btw, I just read your profile and had no idea you have 5 kids!! Idk how you managed to do this with 5 kids! AMAZING!!! Haha. You didn’t? I don’t lead with it necessarily… most people question my sanity. I have the best babysitter/ nanny on the planet, but I leave them to run loose most of the time. 🙂 Your room is adorable, btw!! Thanks, Kimberly! I wish I could have every room in my house like this, but I’m afraid the family might object! Ha! It is stunning!!! 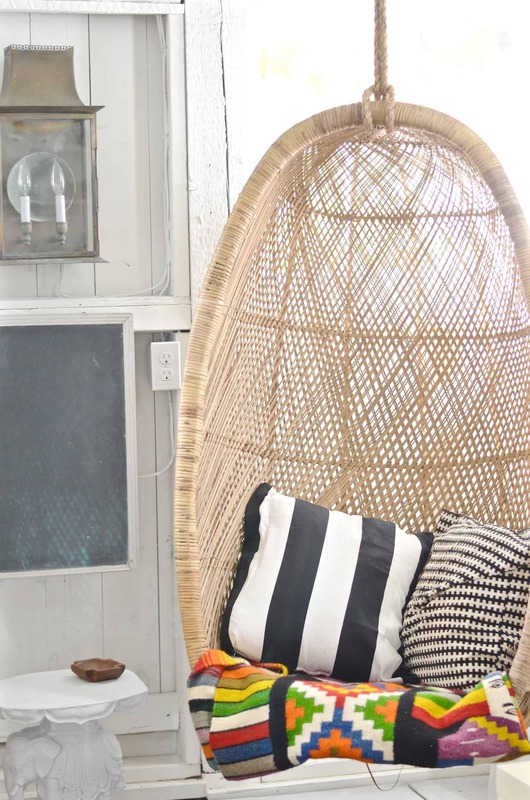 I love the wicker with the black and white! This room is so fun! I love how many uses it has! Great job! Thanks, Emy! 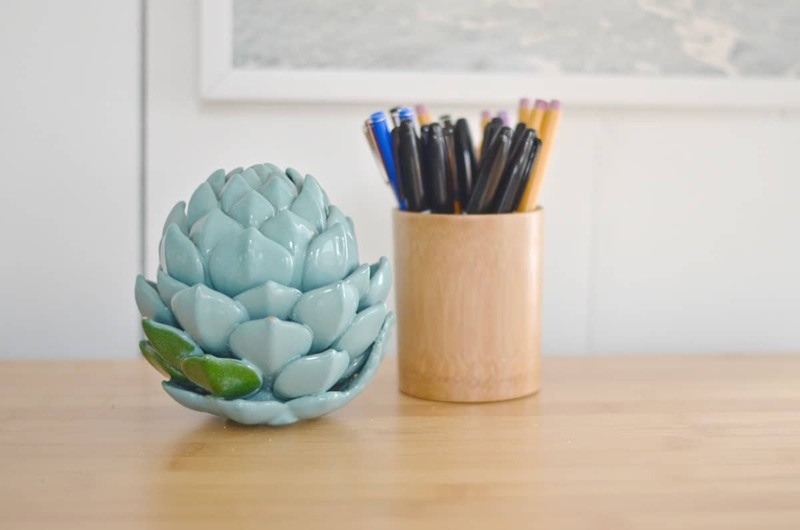 It’s like the Swiss Army Knife of DIY decor! 🙂 Ha! This is perfection! I absolutely need a space like this in my life too, but we don’t have the room for it. Darn it! Guess I’ll be daydreaming about your wonderful space. Enjoy it! Haha! THanks!!! I truly couldn’t believe how large the space was until it was cleared out and painted white! Wowza! Don’t you just pinch yourself every time to walk into this beautiful room?! 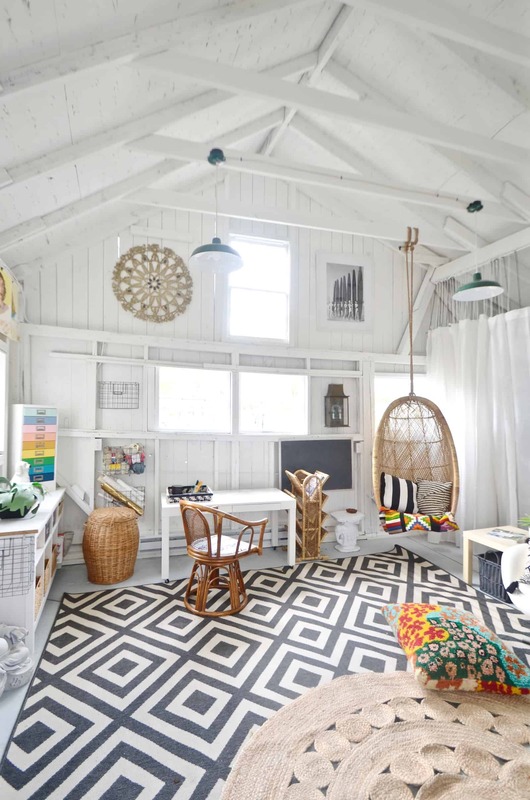 Your shed transformation is gorgeous – can’t wait to see the creativity you produce from your new space. Hail to the She Sheds!! Yes!!!! Also… I have chocolate out there so it’s a win-win! 🙂 HAIL! What a fun space!! How nice to have a room (shed!) just for you and all the crafting/tools/blogging supplies!! Enjoy it! THanks, Meg! It really does have EVERYthing in there! Haha! Charlotte, this is ah-maze-ing!! Ahhh-maze-ing!!! 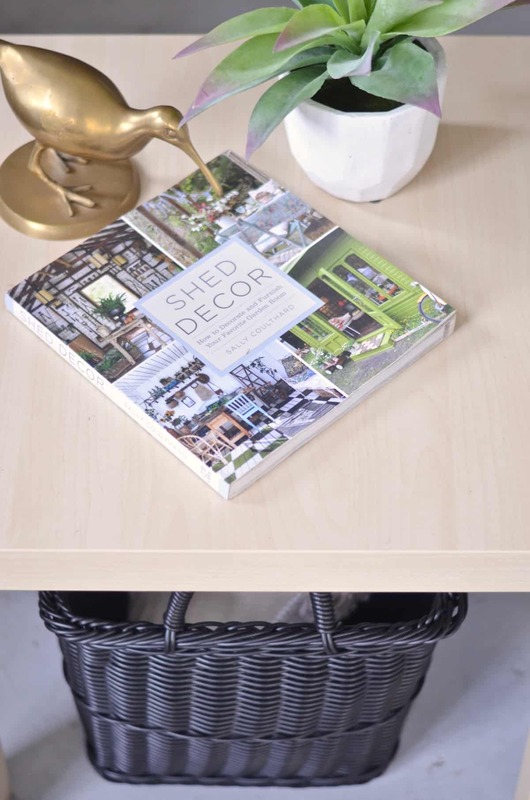 I love all of the different functions your shed serves, and how stylishly you pulled it off – this space is 110% you! And you’re right – the most important thing is that our spaces reflect us. 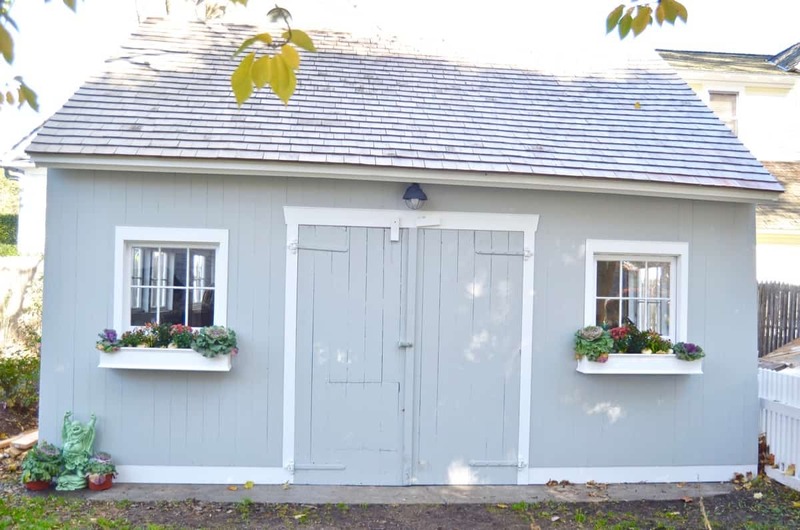 Congratulations on bringing your your dream shed to life! I cannot believe how much you packed into that space. 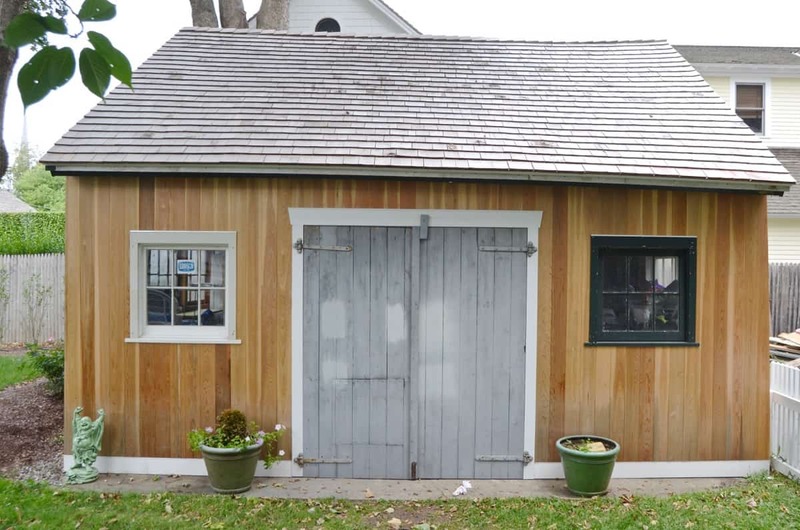 Up until the picture of the outside, I thought this shed was the size of a barn! 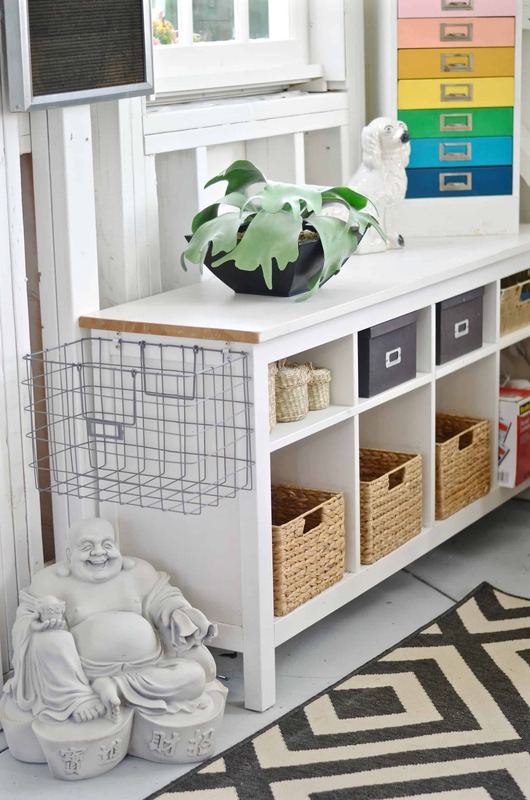 You did such an amazing job of creating an open, functional, organized space. I love that you filled it with things you love and treasure. That’s what a space should be. Well done! Haha! I was secretly a little surprised too!!! It seemed so dark and then the white paint went on and… WHOA. Thanks, Erin! Oh my! My favorite little space. I love it! It is like a WONDERLAND! Great job! Thanks, Delia! I love it! Love love LOVE! You’ve created such an amazing space. Great job! this is just insane! What an amazing vision you had to put this together, and so little time. Thanks, Mila! Your room was just as stunning! Charlotte, you killed it! I could live in your shed, haha! Such a pretty transformation. Omgosh! I just stumbled across your orc doing research for my own and I read every single post about your shed! fantastic job, it looks amazing! good for you! and you’re hilarious! Okay, seriously!! I have such shed envy right now!!! I just came across this post and I’m in AWEE! You rocked this! i DON’T KNOW IF i have ever loved a space more. There is something unique and useful in ever space. I adore that you made this space work for you in every way. 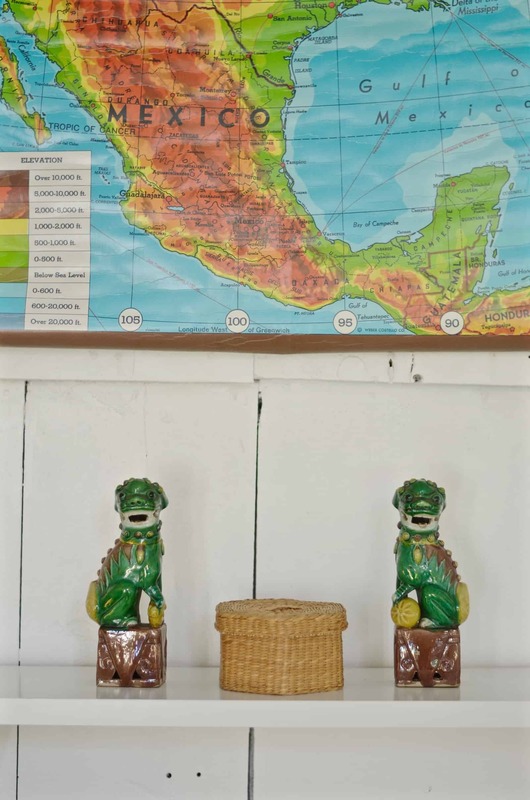 Even though this space hosts so many different things it all flows and seems organized. Great job! Ha! YOu’re SO sweet! I’m with you… love this space! Can’t wait to have a full spring/ summer season in which to work out there! THANKS! Love your space so much! I can only imagine what it would be like to walk in, sit down and enjoy! 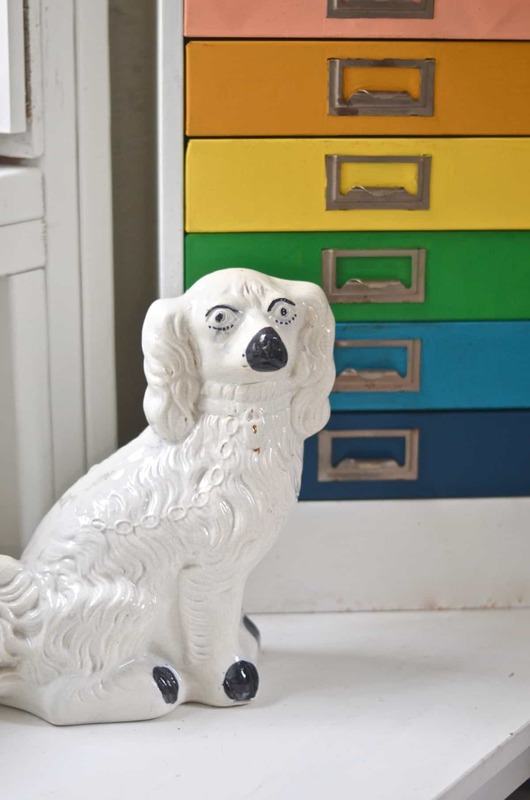 Where did you get the rainbow drawers with the white outside? Totally blown away by your ‘shed’. Love everything about it – you are soooo lucky. 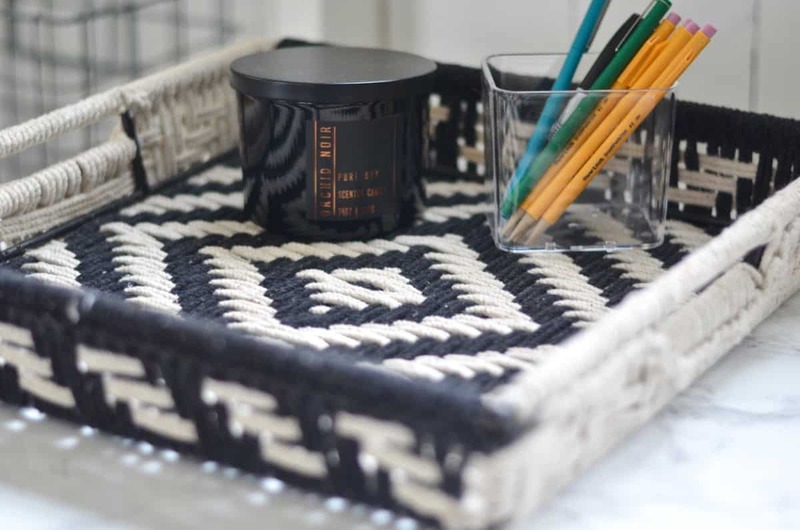 The one thing that leapt out at me in the before and after pictures, is the cane/wicker rack – for magazines or prints etc. So love this. 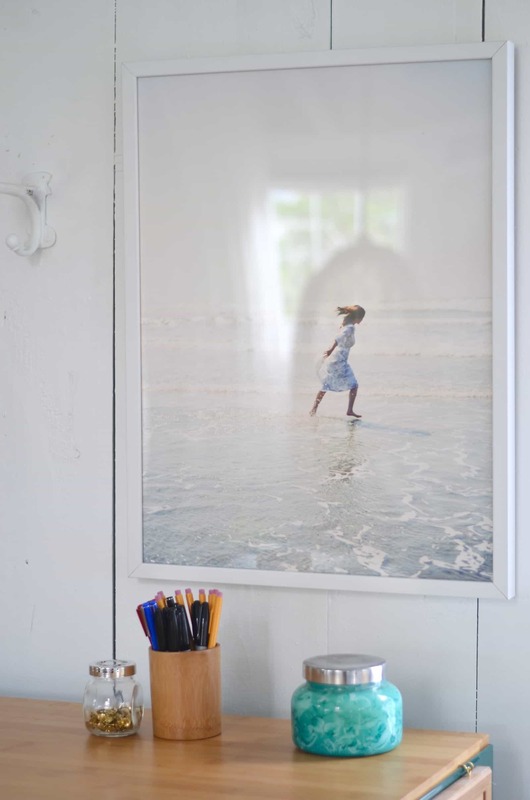 something like this WOuld be perfect for me to use to display mounted prints at craft markets. Love it all. Hi, I came here via your post on apt therapy. i have one question — what is your heat source? it MUST get unbearably cold in there during the winter. Hi! Heat’s a GREAT question. 🙂 We actually had the electrician install base board heaters so we could hopefully keep my paint from freezing, but… it was costing a FORTUNE. (Duh.) So… I built a heated cabinet for the paint and use a space heater when I’m out there working in the winter! No question it’s chilly, but I bundle up and it’s not so bad! Wow! I’ve had baseboard heaT, so i know how costly it is. Your heaTed cabinet & space heater Are gREat sOlUtiOns. Thanks for the quick answer & INSPIRATION!